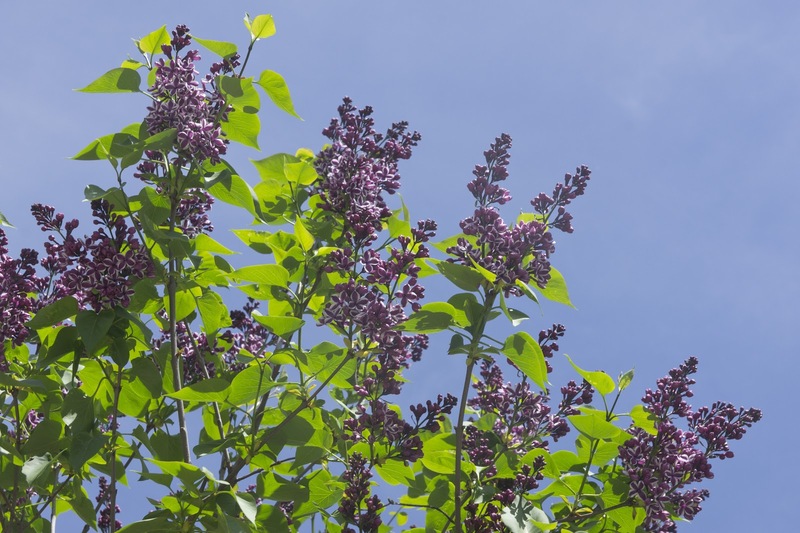 It will be six years this spring --- and I'm still waiting for my lilac bush to bloom. Sixteen years ago in the spring after my dad died, my friend, Midge, asked me to dig up a corner of the lilac bush which had bloomed in my folks' back yard for all the years we lived there. She wanted something to remember him by. And so I did, packaging the roots in wet paper towels and transporting it several hours to her back yard. She planted it off the corner of her deck and within a couple of years it was showing off lovely purple blossoms. In the years since, my mother moved from the big old farm house on the edge of town to a home which better suited her needs. In the scurry of helping her pack and move and settle in, it did not occur to me to dig up such mementos to take along for her, for all of us, as well. Six years ago next month Midge also died. We gathered for her funeral in March. A few months later, her family asked me to join them on a Sunday afternoon in May where together we would scatters her ashes on her husband's grave. I drove the two hours directly from church to South Bend, Indiana that afternoon. I met them at her house where her children were sorting and packing up a lifetime of memories and together we caravanned to the cemetery. The service we shared in then was short. In fact, it seemed as though the actual scattering took longer than the words spoken. Again and again and again, I reached my bare hand into the urn pulling out handful after handful of ash. Before I made the trip that day, I remembered that another friend had suggested that I dig up a corner of that lilac bush and bring it home. And so as the sun was setting that afternoon I borrowed a shovel and with ashes still under my fingernails I dug up a shoot from that lilac bush, wrapped it in wet paper towels and propped it up in a plastic cup and brought it home. I planted it the next day in the rain. And I've been waiting for it to bloom ever since. 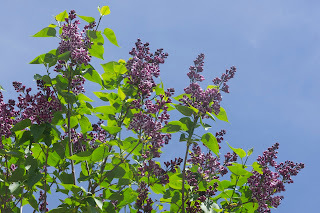 I've been told it takes several years for transplanted lilac bushes to bloom, but from all of my research it seems as though we are on the outer edge of that hopeful expectation. The tiny sprig has grown into a shrub that now stands as tall as I do. It leafs out every year. Through my kitchen window I can see that the buds are ripe and are just waiting for the snow to melt so that it can leaf out once more. This should be the year it blooms. I am so hoping it is. But if it doesn't, I can't imagine digging it up and replacing it with one from the local nursery. This one holds too much of who I am and where I come from. I played under its 'grandmother's' fragrant branches as a child. We cut its blooms and wrapped them in wet paper towels and aluminum foil and carried them as gifts to our teachers at the grade school down the street. And of course by now it is also all caught up with memories of those I have cared for who have gone before. And so it is so that I can completely understand the action of the farmer in Jesus' image today where he gives that fig tree one more year. I can't imagine, though, that the tree Jesus speaks of now held nearly the same emotional value as does my lilac bush. But even at that, the gardener insists on giving it one more year. And yet, there is one way in which this story contrasts with my lilac bush. For you see, I pretty much planted it and did little more to ensure its thriving. The gardener in this story, and God in this analogy, keeps piling on the gifts which should lead us to bear fruit --- which should lead us home into God's presence. Of course, the fig tree doesn't need to recognize the gift of the manure for it to do its work. You and I are a little different. Indeed, it seems to me we have to pray for open hearts and minds and spirits to be able to recognize those gifts which surround us, which are piled on top of us, reminding us of God's great love for us. Thankfully, they are usually sweeter smelling than manure, these gifts of family and friends who share the journey with us; these gifts of all those things which nurture us body and soul: these gifts of health and strength, curiosity and joy, wonder and acceptance. All of these and so many more are all gifts from God's own hand --- shaping me into one who should only want to return to God's presence, not only once, but over and over again: like that fig tree which once it bears fruit, presumably keeps on doing so season after season. And so I wonder now. Will I need one more year? Why not now? Why do you think the gardener in Jesus' story gives the fig tree one more year? Are there other ways besides those mentioned above in which God behaves like the gardener does in relationship to God's people? What are the gifts which, like manure, nurture you in life and in faith? What does our 'fruit' look like? What role does 'repentance' play in your walk of faith? In that of the life of your congregation? Your community? I also got lilacs from my elementary students when I taught in Pontiac, Michigan. When the first ones were placed on my desk, I commented on how much I liked them and the wonderful treat for my eyes and nose. You can imagine what happened the next morning. My desk was covered! I've often remembered the generous sharing of my fourth graders. The event remains a highlight of that school year. Jerry, this is a beautiful image and a wonderful memory. Thanks for sharing it!